﻿A Hog Roast York Birthday Hog Roast Event! 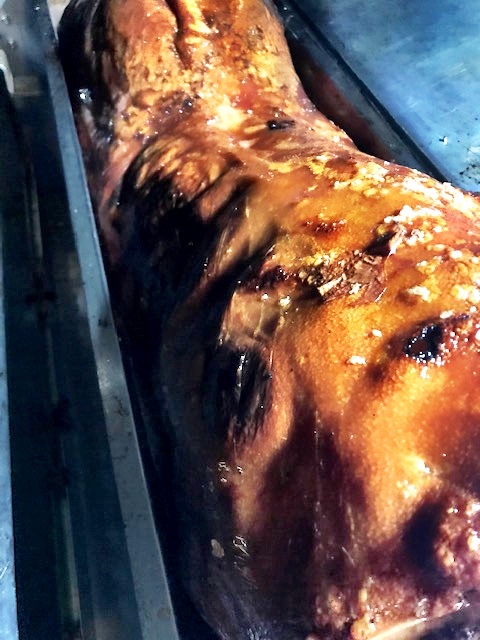 Recently, the Hog Roast York team were hired by Lorien, a local client. The event was a 40th birthday party that was to be held at Osbaldwick Sports Club located in York. Lorien selected Menu Three for the Hog Roast team to serve to her guests. This menu included a whole slow roasted hog, cooked to perfection on site in one of the team’s Hog Master machines. The delicious hog meat was served with crispy crackling, homemade stuffing and classic apple sauce. The meat was cooked evenly and seasoned well by the team’s chefs. The classic roasted hog was placed on the buffet as the centrepiece and carved professionally by the Hog Roast York team’s Head Chef. In addition to the traditional accompaniments of the hog meat, the team also served a selection of sauces, fresh bread rolls and wraps. Instead of serving classic new potatoes with the meat, Lorien requested a side of chips which the team were happy to supply. In addition, vegetable skewers were served as a side and an alternative to the main meat. The buffet was served at 8pm and the food was served to 100 guests so it was important that all the food was ready to be placed on the buffet at the same time so that the Hog Roast York team could top up the buffet at the guests served themselves. The service ran smoothly and was led by the Hog Roast team’s Head Chef, Jon, who checked over all of the food before it was served to ensure that everything met the high standards that the team uphold. The food was served in professional heated metal trays which kept the food warm. All of the food was created using local ingredients to ensure that everything tasted fantastically fresh. The client, Lorien, had some fantastic feedback for the team after the service and was happy to recommend the team to friends. They were pleased with the service and were very pleased by how friendly the team had been. In addition, they said that all of their guests enjoyed the food and were impressed by the team’s professional catering standards. Hog Roast For Huddersfield Town Football Clubs family fun day. Hogmaster Hire for a Pop Up Ski Lodge Bar!